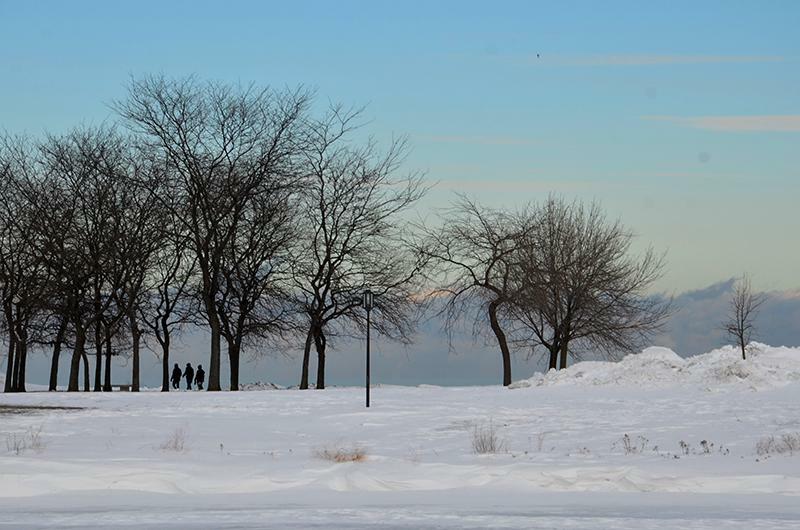 Three students take a stroll in 2014 on the Lakefill, the last time classes were canceled. The University will operate limited functions this week due to the extreme weather. Northwestern administrators have canceled classes and other University functions for parts of this week ahead of extreme temperatures that are expected to reach 20 degrees below zero. Provost Jonathan Holloway, President Morton Schapiro and Craig Johnson, the vice president for business and finance, said the University will continue operating “essential services,” including University Police, facilities management and dining halls, while the Evanston and Chicago campuses are closed. The closure will take place from Tuesday at 8 p.m. through noon on Thursday. The U.S. National Weather Service predicts temperatures will reach below negative 20 degrees, with wind chills of 30 to 50 below zero. It warns of “extreme excessive cold risk” from Tuesday to Thursday. Professors had already began cancelling classes before the official announcement was made. Staff members had been considering closing down offices from their own direction. Northwestern has historically been reluctant to shut the school down. The last time NU closed down due to weather was during the “polar vortex” of 2014, which delayed the start of Winter Quarter. The University has shut down due to weather only six times since 1918, making this time the seventh.